Exclusively ours. 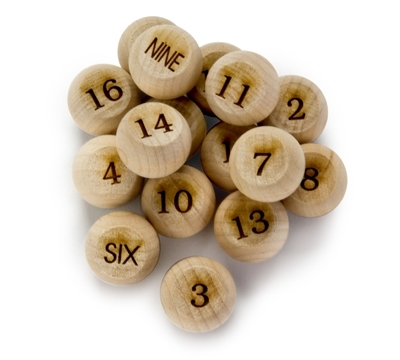 These solid maple wood peas are individually laser engraved so the numbers won't wear off. No other wood pea even comes close. Made in USA. Set includes numbers 1 through 16. Rules for bottle pool are found in our BCA Rule Book, product #46-360. Click here for BCA Rule Book. Leather Shake Bottle (#LB12) sold separately. Click here for Leather Shake Bottle.